THE BLOG ARCOORLO GUANTANAMERO ,CUBA: WILL THE CONSUMPTION OF MEAT FOR CUBAN PEOPLE RESOLVED? WILL THE CONSUMPTION OF MEAT FOR CUBAN PEOPLE RESOLVED? PROPOSALS OF GENERAL GUILLERMO GARCÍA FRIAS. 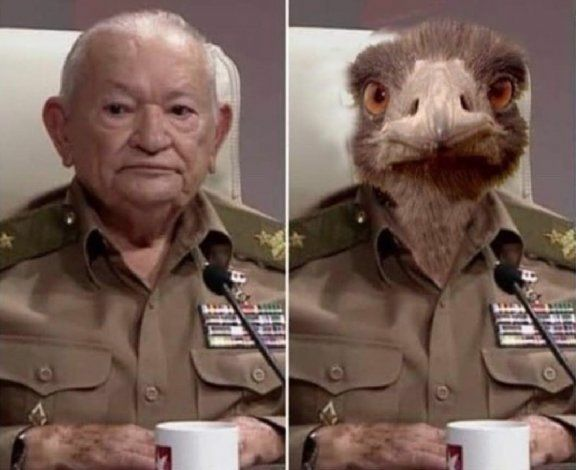 One of the dinosaurs that still refuse to disappear in Cuba proposed, without any modesty, the plans that the Cuban State has to solve the meat consumption of the Cuban people. "in years to come"Nothing less than the consumption of ostrich meat, a greater proportion than that of cows, and that of the oriental conga jutía-they already have several "Miles" breeding sites for those little animals that look like rats but are more chubb and cocodrle meat. Cattle also gave us hope. He explained that a cow gives a single calf a year and then weaning the calf gets pregnant again. The process takes a little longer. The ostriches reproduce more quickly and within several years there will be so many jutias that the town will not go hungry anymore. The ostrich is imported from Africa, accustomed to another climate. Where are the buffaloes that the liar in chief raised in some swamp on the island? I ask this old dinosaur, survivor of the armed struggle to the triumph of the revolution, who will milk the ostriches and jutias so that the people finally take this dairy?And besides, what day laborer will take care of the army of the giant birds and the tiny jutias with the low salary, in pesos or cuc that will beat them? They do not realize that the incentive for these plans is a decent pay that encourages them to work. Unless they put the inmates or return to the voluntary work of the '70s and' 80s so that someone sacrifices for the Fidelista Communism in which nobody believes. The COMUNISM IS THE EXPLOITATION OF MAN BY STATE. IT ONLY BECOMES POVERTY AND MISERY FOR THE PEOPLE, WHILE THE DOMINANT CLASS LIVES LIKE THE DICTATORSHIP OF THE PROLETARIAT, IN THE WEALTH. We just have to wait. Patience Cuban people. Patience.